the recently held elections in Karnataka paved the way for several mine owners to the state assembly. Some of them who belong to Bellary district have even got key ministerial berths such as the revenue ministry and the ministry of tourism and infrastructure development. The district, located in the eastern part of the state, produces about a fifth of the iron ore produced in the country. At the same time, a state body looking into the issue of illegal mining is expected to submit a report by June end. Down To Earth (dte) has learnt that the investigating body has found several irregularities in the existing system that affects people, agriculture, forests and wildlife. The state government referred the issue of illegal mining to the lokayukta, a one-member grievance cell.The lokayukta used the services of forest officials, retired judges, former officials of the mines and mineral department and the police for the investigation. "Notices have been sent to 25-30 senior bureaucrats and about 20 politicians for clearing illegal allotments and other violations," Santosh Hegde, the lokayukta, told dte. Hegde added that it is the people who suffer the most because of the irregularities. "Those who own mines enjoy a plush lifestyle elsewhere," he said. Hegde visited several villages in the district and found illegal mining was a common problem and the units didn't follow the Indian Bureau of Mines' (ibm) standards. According to ibm, mining is supposed to take place as per the mine and excavation maps. Waste is supposed to be brought to the dumping place instead of leaving it to slide down hilltops. Mines are supposed to have a flora and fauna conservation plan. Instead, says the forest department, land has been encroached upon. At Vijaynagar, for instance, the team found illegal mining on about 22 hectares (ha) and in Rajapura mines, the forest department map and the revenue department map did not tally. Also, the road from Hospet to Sandur was dotted with stockyards, most of which had no environmental clearance to stock iron ore, Hegde said. The Kineta minerals in Jaisinghpur is a case in point. He found that the company was involved in trading without any prior permission and had stocked 1,600 tonnes of iron ore without permission for conversion of land. Such examples are numerous, Hegde told dte. Currently, there are 31 sponge iron plants in operation in the district and 10 more are expected to come up in the next year and a half. Some of the common complaints villagers have include dust affecting their crops, cattle drinking polluted water released by the plants and an increase in asthma and tuberculosis cases. "Smoke is released from the sponge iron plant at night and houses and trees are covered with soot,'' said Shanmugappa, a resident. Forests are also a crucial area. Bellary has 127,000 ha of forest cover. Of this, there is legal sanction to mine on 7,000 ha, where there are 74 active mines and 23 abandoned mines. "But it spills to another 7,000 ha of illegal mining,'' said Vijay Kumar Gogi, conservator of forests. Also, every environmental clearance for mining in a forest area comes with the mandate of forming a wildlife conservation zone. "So far, not one such plan has been drawn,'' said K R Baig, deputy conservator of forests and regional director, Department of Environment and Ecology. Any industrial activity within 10 km of a wildlife sanctuary has to be ratified by the National Board for Wildlife. But there are over 30 mines operating within the Daroji Bear Sanctuary that have not been ratified by the board. Wildlife in the Sandur forests are threatened and several species such as the Egyptian vulture, yellow throated bulbul, white backed vulture and four-horned antelopes have vanished. "The area has about 300 kinds of medicinal plants,'' said Santosh Martin of the Bellary Environment and Wildlife Foundation. Local politicians, however, say both can coexist. "Most violations are minor. I shall sit with mine owners' associations and make out a charter," says Anand Singh, who won from the Vijaynagar constituency. 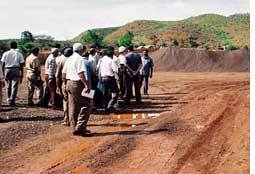 Singh, also known as a social worker, exports iron ore and supplies it to the Jindal group of industries. Saying there is no conflict of interest, he adds "I will work for society the way I work as a businessman."